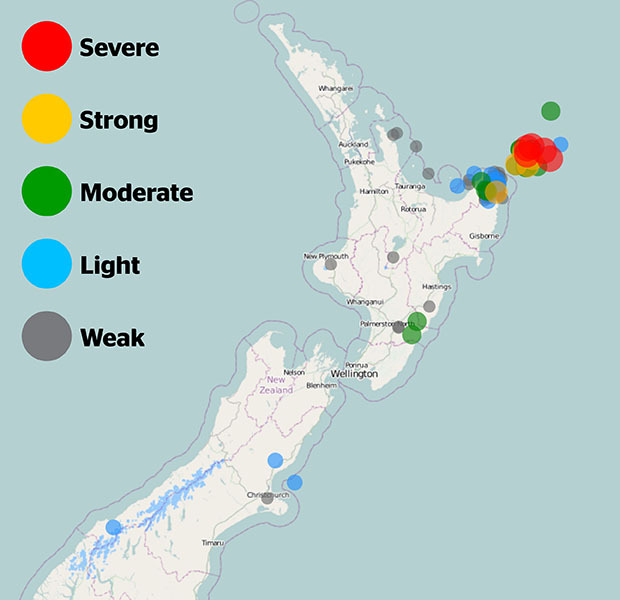 This morning's M7.1 quake is the biggest to hit the north of the North Island in more than 20 years, when a M7.2 quake struck in a similar spot in 1995. Many North Island residents were shaken awake by today's quake at 4.37am, around 100km northeast of the East Cape settlement of Te Araroa, at a depth of 55km. GNS Seismologist John Ristau said earthquakes around the M5 mark in the Gisborne area were not uncommon, happening about once a year. "It's one of the more seismically active areas in New Zealand. But to have a M7.1 earthquake is unusual." In February 1995 a M7.2 quake was recorded 100km east of Te Araroa, slightly further south than today's. A M6.8 quake was recorded in the same area in November 2014. This morning's quake occurred near, but not on, an interface boundary, sometimes referred to as a fault line. "What you have in New Zealand is you have the North Island sitting on the Australian tectonic plate and off East coast you have the Pacific plate that's pushing beneath the North Island. "That generally causes a lot of earthquakes along the East coast. What we call it is a plate interface boundary." As the Pacific plate burrowed under the Australian plate to the east of the North Island it would bend and crack during the process, referred to as sub ducting. This sub ducting system created energy and tension which was sometimes released as earthquakes, Ristau said. This morning's quake was likely related to a 5.7 magnitude quake in a similar area yesterday, said GeoNet seismologist Anna Kaiser. As dozens of aftershocks continued to rattle the region, people should remember to be vigilant, Kaiser said. "​It's likely we'll have aftershocks in the coming days and update people as things progress." It was typical to feel a few shocks similar to the magnitude of the original quake, which had already happened once this morning. Because the quake was off shore some after shocks would not be felt, she said, but people should stay alert to the possibility larger ones would be felt.